Since he started playing football at 9, Chantz Staden's goal has been to earn a Division I scholarship. The former Westmont standout was disappointed when he was passed by after his senior year of high school. But this week Staden, after an impressive sophomore season at De Anza College, made an oral commitment to play at Washington State. "This is like a dream come true for me," said Staden, who led California junior college players with 18 touchdowns and 110 points this season. "To play for a Division I school, let alone a Pac-10 team . . . It hasn't really hit me yet and probably won't until I step on campus." A gifted receiver who can line up anywhere in an offense, Staden rushed for 755 yards in 167 carries and caught 50 passes for 855 yards this season. He earned first-team All-American honors from JC Grid-Wire. "Chantz is going to fit right in - he couldn't ask for a better situation," said De Anza offensive coordinator Tony Santos, who also coached Staden at Westmont. "Washington State has new coaches and they are going to put in a no-huddle, spread offense. They were looking for a character guy, and they got one. Chantz is a first-class kid." With the offseason here for all but four teams and many of them in need of a quarterback, it's fun to look ahead to the NFL draft with visions of Brian Brohm, Matt Ryan, Colt Brennan and Andre' Woodson dancing in our heads. It's also scary as hell because evaluating college quarterbacks has become a nightmare. The rise of the spread offense has made the college game so different from the pro game. Even traditional running powers such as Oklahoma are lining up in the shotgun, spreading the field with four or five receivers and throwing the ball all over the place. And that makes it difficult to know what you're getting when you draft a quarterback from that background. There's a world of difference between taking snaps under center and taking snaps five or six yards farther back. Think about it: Brennan started at Hawaii for three years and never turned his back to the defense. That's huge. We take it for granted that Peyton Manning can take a snap under center, turn and fake to Joseph Addai, then turn back around and face a defense that probably was disguised when he saw it before, refocus his eyes downfield, locate an open receiver and release the ball on his fifth or seventh step. Manning makes it look easy, but it isn't. And if Brennan has never done it in college, why should we think he can learn to do it in the NFL? Alex Smith, the No. 1 pick in the 2005 draft, is still trying to figure it out. It's hard. Teams can realistically assess the abilities of Ryan, an NFL prototype quarterback from Boston College, and Brohm, who played in a pro-style offense at Louisville. But how can they judge Brennan, Woodson and so many others who spent most of their time in spread formations? These prospects will be asked to show pro-style skills such as dropping back and executing play-action at the Combine and individual workouts, but those are artificial environments. The real world of the NFL will be less forgiving. Think of a G.M. who invests a high pick in a spread quarterback as Forrest Gump reaching into his box of chocolates. With no idea what he's gonna get. Reports out of Morgantown, West Virginia are that Steve Slaton has decided to leave the West Virginia University football team early and enter the NFL draft this April. Slaton, a junior who has put up some very impressive numbers in his career will be remembered by the staff at SpreadOffense.com as a pioneer player in the latest evolution of the spread offense. When #10 came onto the scene for WVU in a close loss to Virginia Tech in 2005, he instantly created a spark along with Patrick White that catapulted the Mountaineer's to national prominence. 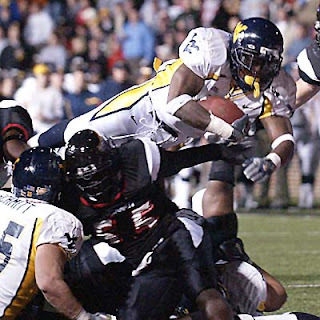 Steve Slaton ran for 3,923 and scored 55 touchdowns in 3 years at West Virginia. He was the MVP of the 2006 Sugar Bowl after rushing for 204 yards on 26 carries and scoring three touchdowns when WVU upset Georgia. One of Slaton's most memorable games was in 2005 versus Louisville. Slaton scored 6 touchdown's as the Mountaineer's came back from 21 points down to win in triple overtime. This year Slaton's carries dropped as WVU shared the wealth between Slaton, White, and newcomer in the backfield Noel Devine. Thanks for the memories Super Steve... show them what you got in the NFL.